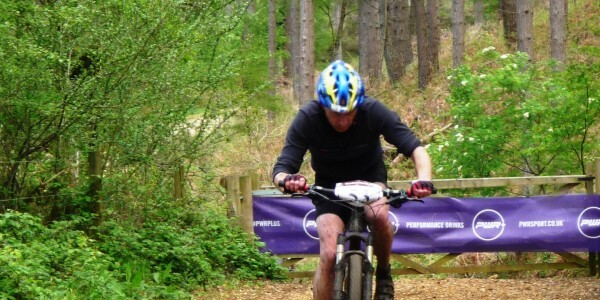 My plan was to do a two hour bike ride on the Sunday but I found this race online & as I am enjoying my mountain biking at the moment, I thought that I would have a go at this two hour MTB race as I have never done an enduro race before, being a total newbie to this mountain bike lark. I could have done without the La Mans start as I had done all of my running yesterday!! It was a bit of a mass bundle to get to the bikes with about 100+ riders, so I didn’t want to get involved with too much fighting as I’ve got bigger fish to fry later on in the season. However, the only problem with this was after about 1/2 mile of wide tracks, we were onto narrow single tracks & being so far back it was a case of just riding behind the person in front waiting for a chance to overtake. But once we had started lap two things were nicely spread out & I just got on with the job in hand working hard. Each lap included three good quality climbs, one which had to be walked/run up, the other two were very technical. Note to self – try & learn to climb better & use the gears in a more productive way. The only downside of each lap were two monster boggy areas. With the mixture of the cows walking through them & doing other things in them as well as all of the competitors riding through them, they were getting very, very deep & very, very smelly (not pleasant). At the end of lap 4, I was coming up the final hill & looked at my computer for it to say 1hr 54mins. Now the enduro race was to last two hours, so when I passed the finish line I was only to be told by the officials underneath the gazebo (& by Coach 2) that there was still 6 minutes left on the clock before the fog-horn was blown to end the race, so I had to do another lap. Not good for the mind-set. I really had to re-focus & get on with the extra pain of doing another lap & trying to keep up with a female competitor as well as another bloke in front of me. I did quite well until about the last 10mins of the race when the piano landed on my back!!! I did get to cross the finish line, but a friend of ours said that I looked as pale as plaster when I’d finished. I had put everything I had into this last lap. As my Sunday bike rides of late have only been two hours long, this felt like a marathon. I’m not sure of my position as the results aren’t posted yet, but I’m not too fussed as the reason for this weekend was to have a good workout & ascertain how everything was progressing before my proper race season starts.